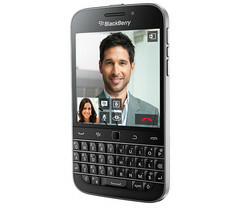 This long-awaited handset with a 35-key QWERTY keypad, dual-core processor and square touchscreen can finally be purchased for $449 unlocked from ShopBlackBerry and Amazon. BlackBerry Classic has been up for pre-order since November and now it is finally available for purchase from Amazon and BlackBerry's online store, as well as from other sources. This smartphone brings back the classic BlackBerry design with a QWERTY keyboard, trackpad, and navigation buttons. This handset promises a battery life of up to 22 hours of mixed usage on a single charge, but up to 70 hours of audio and almost 14 hours of video playback. BlackBerry Classic will soon hit Verizon and AT&T, but can be already purchased from Amazon and ShopBlackBerry.com as mentioned in the beginning, where it sells unlocked for $449 USD.